Thankfully, Remington did NOT use a plastic stock on the M600 as they did on the very space-age looking XP-100 when it was introduced (actually nylon, or DuPont Zytel). Carbines are handy, but do they have real power? That’s what I asked Carl. Then he lent me his new Remington Model 600. My big buck is being mounted now. Don’t make the mistake I almost made. Don’t class the Remington Model 600 with other carbines. I found the 600 is a carbine in a class by itself. I just got my second M600 a few weeks ago. It is in caliber .308 Winchester. They have become somewhat collectible in recent years. Since I now own two of these old and unusual guns, I guess it could be said that I have joined the ranks of Model 600 collectors. I think that I got my first M600 about ten years ago, an example in 6mm Remington caliber. I wasn’t looking for one, but a buddy at work mentioned that he knew someone who was trying to sell one. So this buddy brought it to work one day, where he showed it to me out of the trunk of his car. OK, yeah, kinda neat. It was the first M600 that I had ever laid eyes on. But I really didn’t need or particularly want it, so I threw out a low-ball offer just for the heck of it. After my buddy checked with the seller, a couple of days later I learned that my offer was accepted! I was a bit stunned but now I had to make good on my offer. When it was introduced, it was so unusual, that people didn’t know what to think of it. Many people described it as ugly. They decried the offset bolt handle, the useless plastic vent rib, the tall shark fin front sight, the velocity-robbing “too-short” barrel. So no, the M600 was not a runaway best seller. I think that the M600’s basic problem was that it was so different, that in most gun buyers’ minds, it lost the comparison to both lever action carbines, and to the typical 24” barrel .30-06 or .270 bolt action deer rifle of the day. Like Carl’s buddy over there, unless you have a chance to carry one afield, and shoot it, you just won’t “get it”. After getting my 6mm, I did carry it afield, I shot it, and the light turned on for me. I fell in love with the Model 600. It’s basic advantage is that it is so light and short, that it is absolutely wonderful to carry up and down the kind of steep canyon slopes that we have so much of here in Arizona. 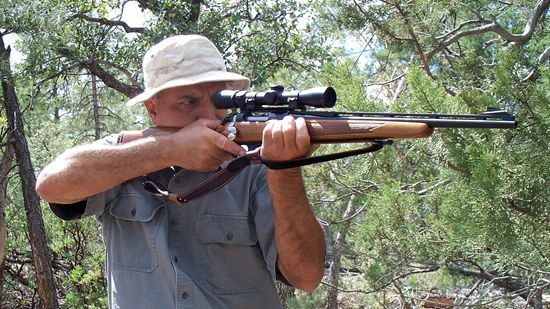 Yet, it is perfectly capable of reaching out 250 yards or more to make a cross-canyon shot. Sometimes I find myself pushing through thick jungles of manzanita, scrub oak, or catclaw. Because it is light, it is easy to grab by the wrist of the stock one-handed, raise it straight up into the air, or push it out in front of you as you weave your way through the thick brush. The 6mm M600 is my favorite hiking rifle. Sometimes when I am doing my other outdoor pastime, backcountry geocaching, I take the 6mm along just in case I should scare up a coyote, and just because I enjoy its company. Sometimes my geocaching adventures take me to Arizona’s southern border. Running around solo in the borderland backcountry is not for the faint of heart. Being stoutly armed is good policy. Yet, hiking with an AR-15 with a 30 round magazine might not be as comforting as you would think. It could actually make you a target because they want what you’ve got. My answer is the M600 and an orange cap. I want to look like a hunter, not a militia member nor a drug smuggler. Most of the time, I don’t notice the M600 on my shoulder, but light means fast to employ, and 6mm Remington means that it has the reach and accuracy to keep an adversary’s head down if it should ever come to that. But brown wood and a traditional stock is less provocative to Border Patrol (which I have frequent encounters with down there), or to any bad guys that might spot me. Well, unless I happen to run into another M600 collector! 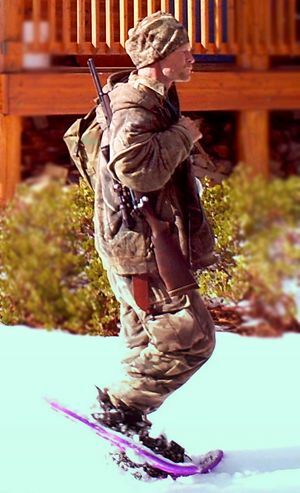 Speaking of bad guys with an M600 – do you guys remember hearing the story of the Utah “mountain man”? This guy lived off the land in the southern Utah backcountry for seven years. That’s all well and good until he started breaking into vacation cabins, stealing food and guns, living in the cabins in the off season. The case was broken when his image was captured by a game camera in a vacation cabin area. Over his shoulder was a Remington Model 600. He was finally captured in early April 2013. 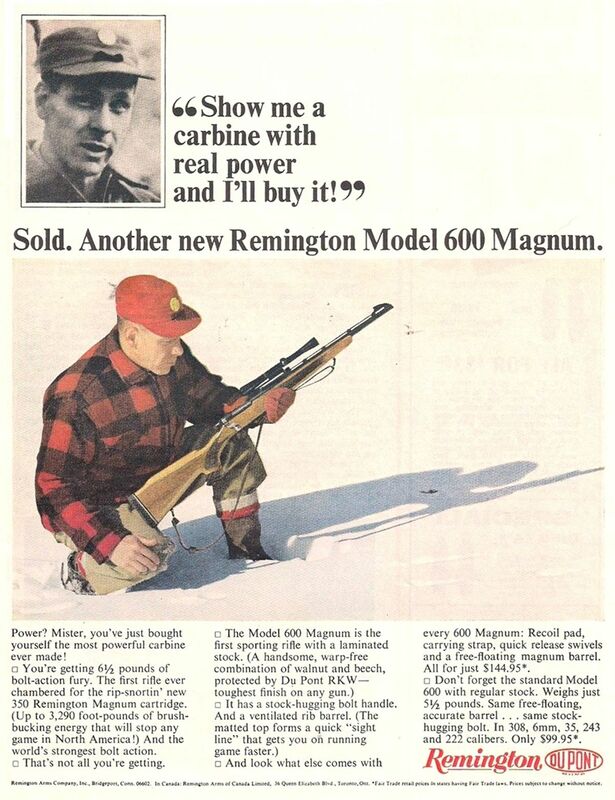 The Remington Model 600 was the prototype of Jeff Cooper’s Scout Rifle concept. The forward mounted, long eye relief scope was actually NOT Cooper’s innovation. The M600 was introduced with two scope mounts by Redfield and Leupold which used the rear sight and rib mount screw holes to mount an extended eye relief low power scope ahead of the gun’s ejection port. This type of scope mounting arrangement was also available at the time for the Winchester top-ejecting lever rifles. This further reinforces the idea that the lever action market was the target for Remington’s new bolt action carbine. With the forward mounted scope and chambered in .308 Winchester, the M600 pretty much meets all of the criteria for weight, length, cartridge power, etc. that Cooper laid down to define a Scout Rifle. I have scoped my M600s conventionally, not scout-style. But in keeping with the basic reason for the M600, short and light, I went with small scopes of 2-7 power. The .308’s scope has a 32mm objective lens, and my 6mm is equipped with a 2-7x28. Personally, I wouldn’t go larger than a 32mm. Both scopes are mounted as low as possible, and both are modern Weavers. I have seen photos of some M600s with high mount rings and large “moon scopes”. To me, something like that appears wholly out of balance. It seems to defeat the spiritual essence of the Remington Model 600. Let me give my take on a number of the oft-repeated criticisms of the Model 600. First let’s talk about that dogleg bolt handle. The June 2014 issue of NRA's American Hunter magazine reveals the reason for the dogleg bolt handle on the XP100 pistol: “The XP-100’s bolt was doglegged in shape because Remington had found a straight bolt would hit the shooter’s wrist during recoil.” Now look at the M600 and think about where the bolt knob would be if the handle was straight. The rear receiver bridge of this action is very short. In addition, the entire receiver is set rather rearward in the stock. Both of these features help to shorten the overall length of the carbine. But this would also cause the bolt knob, if the handle was straight, to interfere with your hand and trigger finger placement. The kink into the bolt handle gets the bolt knob out of the way of the shooter’s hand when in the firing position. It makes me wonder if the pistol was really designed first, and the carbine was a follow-on development, or were they really designed concurrently? Next, what about the short velocity-robbing barrel? There was especially a lot of howling about this for the two magnum versions, in 6.5mm and .350 Remington Magnums. It was loudly said that the short barrel negated the advantage of the magnum chamberings. The critics lost no opportunity to bemoan the excessive muzzle blast of large powder charges exiting the short barrel. To criticize the short barrel because it decreases velocity and increases muzzle blast is to again miss the point of the gun. Long ago I learned that everything in life is a compromise. To gain the advantages of short and light, the consequent tradeoff is reduced velocity and increased blast. Ok, so what? It does what it was designed to do. Today we are seeing more and more rifles being introduced with short barrels. First there are the semi-autos such as the various AR-10-type rifles and the Springfield Armory SOCOM and Scout Squad rifles with 16" and 18" barrels. Then there are the bolt actions such as the Mossberg MVP, or the Ruger Gunsite Scout Rifle. They are likewise hailed for their lightness and easy handling. With 16” to 18” barrels, can we say that these bolt actions are today’s offspring of the Remington Model 600? I think we can. So what’s with that barrel rib? Shotguns wear barrel ribs, not rifles. OK, yes. It’s primarily a styling gimmick. But to me, that vent rib and the shark fin front sight are what define the Model 600. Taken all together, the dogleg bolt handle, the vent rib, the shark fin, the short barrel – they create an unmistakable first glance recognition of the Remington Model 600 carbine. And this, causes the immediate release of copious levels of endorphins into my bloodstream. Ugly? To me it’s very, very cool. Starting in 1968, the Model 600 was replaced by the Model 660. It seems that the Model 660 was a reaction to all the criticisms that were heaped upon the Model 600. First, the model 660 lost the vent rib. It used a more standard front sight blade. The barrel was lengthened from 18” to 20”. The stock was given a black fore end tip. 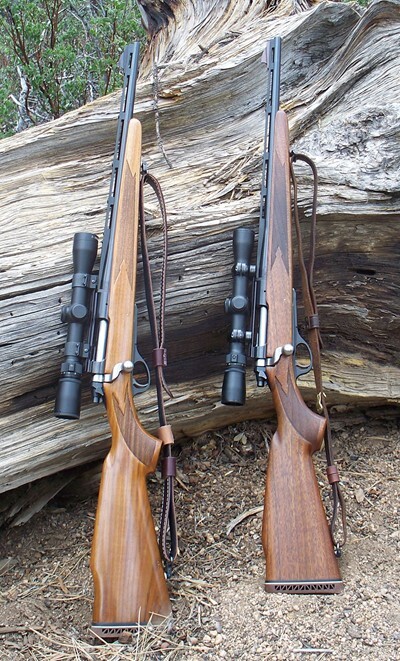 The model 660 looked a lot more like a traditional rifle, compared to the Model 600. Remington still referred to it as a carbine though. After all, they wanted to avoid confusing the consumer. Remington’s flagship rifle was the Model 700, introduced in 1962. With gangbuster sales of the Model 700, it seemed like there was less and less reason to continue the more rifle-like Model 660. The model 660 was discontinued in 1971. It had a short four-year run, just like the Model 600. But Remington still was not quite done with the doglegged bolt action carbine. In the following year, 1972, Remington brought back the Model 600, but as the Model 600 Mohawk. The Mohawk reinstated the 18½” barrel, but still the vent rib was gone. Instead of a walnut stock, the Mohawk used a beech stock. The Mohawk was a bargain-basement rifle meant to be sold by high volume retailers like the large sporting goods chains. Remington kept a high minimum order quantity for the Mohawk. Only the bigger retailers could afford to buy such large batches, but not the mom and pop gun stores. The chains were able to sell them for low prices. The Mohawk lasted through 1979 with a total volume of around 97,600 made. Calibers offered in the Mohawk were .222, .243, 6mm Rem, and .308 Win. A common mistake is to refer to any Model 600 as a “Mohawk”. But the Mohawk name really only applies to this cost-reduced version with beech stock. The original vent rib carbine is simply a “Model 600”, not a Mohawk. The standard caliber offerings for the original Model 600 were .222, .243 Win., 6mm Rem, .308 Win. and .35 Rem. 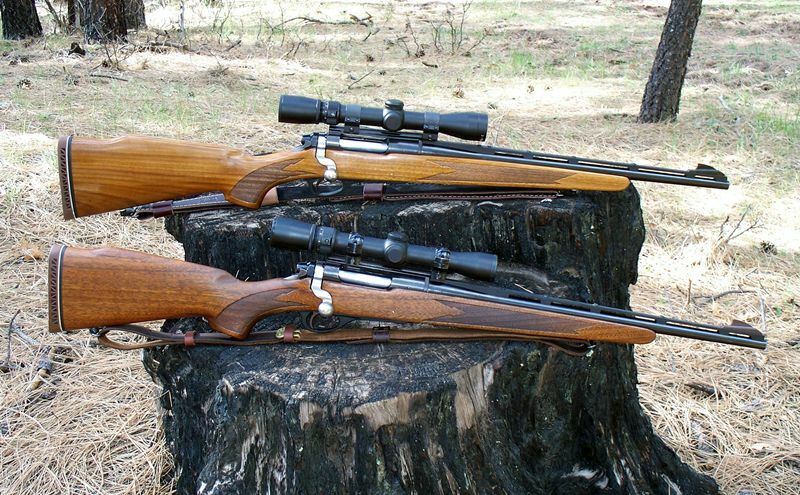 A few were made in .223, but these are very rare and command a very high price to collectors. The standard calibers for the Model 660 were the same with the exception that there was no M660 in .35 Remington. Again a few Model 660s were made in caliber .223, but not many. But both the Model 600 (vent rib original) and the Model 660 were offered in Remington’s own 6.5mm and .350 Remington Magnums, which were introduced for these carbines. There was no Magnum variant of the Mohawk. These two cartridges are generally acknowledged as the industry’s first short action magnums, predating the recent short magnums by many years. Based on the basic H&H case, these early short mags still carried a belt however. The Magnums were marketed as a separate deluxe variation from the standard M600 and M660s. The Magnums were given a special, first in the sporting arms industry, laminated stock. They were also equipped with recoil pads, where the standards were shipped with a flat plastic buttplate. The Magnums also came with a sling included, where the standards did not even have sling swivels from the factory. The laminated stock was not like anything we see today. Instead of many thin layers, the stock was made of only 5 alternating layers of walnut and beech. In the world of the Model 600, the Magnums are the real collectibles. You would be very lucky to find one being offered for less than $1000. The ones chambered for .350 Rem Mag are a little more desirable than the 6.5 RMs, but selling prices around $1100-$1250 are the norm. Brass, especially after the Great Ammo Drought of 2013, is very hard to come by for either the .350 RM, and especially for the 6.5mm RM. You might be able to find loaded ammo, but the cost will be quite high. So while the guns remain quite desirable, being able to shoot one if you have one is kind of tough. I suppose I should mention the Model 673. The Model 673 was not really a variant of the original Model 600, rather it was a Model 7 dressed up to look like a Model 600. Let’s break down that model number: 6 for M600, 7 for Model 7, and 3 for 2003, the year of the M673’s introduction. All M673s wore a laminated stock reminiscent of the original M600 Magnum’s stock, but made of thin laminate layers, as all of today’s laminate stocks are constructed. They tried to get the effect of the 5 thick laminate layers in the original stock by using three brown and two light sections of multilayer thin laminate. The M673 wears an aluminum vent rib and sports a shark fin front sight. But the bolt handle is not doglegged, and the barrel is 22 inches long. So the 673 is really a rifle, not a carbine. It is nowhere near as light and handy as the original M600. Standard calibers were .308 Win., .300 SAUM, 6.5mm Rem Mag, and .350 Rem Mag. The rifle was produced for only two years – 2003-2004. In the late 70’s somewhere between 150 to 200 Mohawk 600 barreled actions were sent to Germany, where they were stocked by Anschutz with Mannlicher style full stocks with Bavarian cheekpieces. A few of these guns made it back to the States when they were purchased by American GIs who were stationed in Germany. Various other oddballs have been reported such as Magnum models with standard walnut stocks, or standard models with Magnum laminated stocks. Perfection on this earth is not possible. So it is with humans, and so it is with firearms. The M600 is not without some warts. First up is a quirky bolt release procedure. You need to insert a small flat blade screwdriver or similar tool between the left rear receiver wall and the bolt body, and push down on the bolt retention catch that lives there. There is an aftermarket doodad that can be installed that will give you a bolt release button as it is on the M700. The next annoyance is the plastic vent rib which can develop cracks and warp, and the plastic trigger guard/magazine base plate unit which is warped downward on many specimens that you will come across. The warpage of the baseplate is not due to constant magazine spring pressure over the years as most will assume. It is really due to improper or impatient reassembly of the action into the stock when the gun is taken apart. Inside the stock there is a sheet metal magazine box. When properly assembled, the box nestles into a raised fence molded into the plastic baseplate. The trouble is that it is very difficult to reassemble the barreled action to the stock while keeping the metal box located within the plastic baseplate fence. So frequently, the action screws get tightened down with the box located on top of the fence, rather than within it, which bows the baseplate. Metal replacements are available on the aftermarket for both the vent rib and the magazine baseplate. Finally, there is the very serious concern that the gun could fire when the safety is moved to the fire position from the safe position. Remington still has an active “safety modification program” to modify the trigger mechanism to prevent this. This is said to occur when the safety is “tested” by pulling the trigger with safety engaged. Then when the safety is moved to the fire position, the gun fires without the trigger having been touched. So far, I have not seen this problem with either of my two guns. Operation of trigger and safety seems positive and robust. The trigger pull on both guns has not been messed with, and I won’t be trying to lighten the pull. I believe that this is the real root of the problem, that attempts to lighten the trigger result in unreliable operation. I will not be sending my guns to Remington to have the safety fix done. The reason is that the modification allows the bolt to be opened with the safety in the safe position. This is Remington’s intention to allow “safe” unloading of the gun. But I need the bolt to be locked when the safety is engaged. It is my habit to carry a rifle over my left shoulder, which places the bolt handle into my side. The act of walking will eventually open an unlocked bolt. While I regard my M600s to be perfectly safe, I still recognize the concerns that led to the recall, and I handle them as if they had the problem. When a round is chambered, I move the safety lever to the fire position only when I’m paying absolute attention to where the muzzle is pointing (as anyone should with any firearm). So from that perspective, the M600’s reputation encourages the most conservative gun handling practices. Actually, this is the same problem that the Remington 700 is accused of having. It is all blamed on the “Walker fire control system”. Remington cannot catch a break with their fire control systems. There is now a new recall on the X-Mark Pro trigger system that affects Model 700 and Model 7 rifles manufactured from May 1, 2006 to April 9, 2014. Google “Remington model 700 recall” for details. For that matter, Google “Remington model 600 recall” for details on the M600 problem. No gun review is complete without some shooting results. So I made up a few different recipes and took them up to the Chino Valley shooting range for some group work. I limited myself to three shot groups because of the skinny barrels. I fired four 3-shot groups for each load, and averaged the results. The vent rib does not seem to negatively impact the 6mm’s accuracy. That 80 grain Sierra Blitz load is sweet. But it looks like a bit more experimentation will be needed to see if the .308 can be tightened up some. I was surprised that the 150 grain Nosler Ballistic Tip load gave the worst groups. That load may also be a little over max pressure, as bolt opening after firing was a bit stiff. I might back off one grain of powder for the 125 grain Sierra load as well. A standard rifle-length .308 should give around 2800 fps with a 150 grain bullet. The short barrel of the M600 seems to struggle just getting to 2700. Though it would be nice to get at least one Magnum model (600 or 660), for now I’m very happy owning two samples in 6mm Rem. and .308 Win.